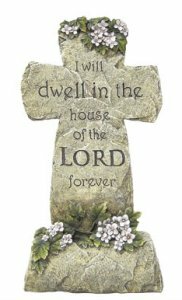 Resin cross statue for indoor or outdoor use, suitable as a graveyard memorial or remembrance statue to reflect someone you loved. Or for a school or church. Resin stone finish statue measures 16 1/2" inches tall. please allow up to 10 working days for delivery time.